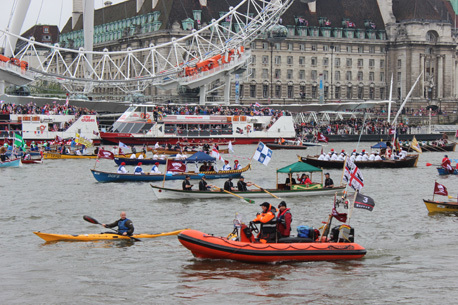 Cunard wasn’t the only cruise line with an involvement in the weekend’s Diamond Jubilee celebrations. Passengers from mv Discovery were in the thick of the action during Sunday’s river pageant. Some were on two charter boats which berthed near Westminster Bridge to watch The Queen and the hundreds of participating vessels pass by; another group watched events from a lofty perch on the 29th floor of Millbank Tower. Even those who chose to remain on board ship for the day as many of the boats from the pageant passed by their mooring at Greenwich once the parade had broken up. “Around midnight Captain John Brocklehurst eased Discovery up the River Thames before performing a 180 degree turn in the river off Greenwich then backing down onto specially-laid buoys to which the vessel was secured. What a berth – in the Greenwich reach just off the UNESCO World Heritage site which includes the former naval college, Queen Anne’s House, the National Maritime Museum and the recently renovated tea clipper Cutty Sark. Discovery was illuminated and presented quite a spectacle as she lay in the river. “Early on Sunday morning, passengers started disembarking. Some were transported by coach into Central London where we had secured tickets for a venue on the 29th floor of Millbank Tower which offered spectacular views over the river. “More than 250 of Discovery’s passengers were disembarked into two chartered river boats that had come out to meet us mid-river. They both made their way up river to berths very close to Westminster Bridge. Once berthed, one on each side of the river, lunch was served and each passenger received a half bottle of champagne to ensure glasses could be fully charged when Her Majesty passed. “Eventually, the barge carrying eight bells passed at the head of the most amazing river parade that London has seen in many a generation. Our passengers had the best seats in the house as Her Majesty and other members of the Royal Family embarked on the Royal Barge. As other craft passed very close by everyone was waving and smiling. Discovery’s passengers all waved back and cheered, toasting the Royal Party as they passed. “Meanwhile, passengers who had chosen to remain aboard Discovery were not disappointed as large sections of the parade continued downriver and passed the vessel at Greenwich. Eventually, the barge that carried the Queen in the first part of the parade passed Discovery at Greenwich and berthed just ahead of her. By now large crowds had gathered on the river banks around Discovery to watch the boats go past. As each section drew level with the vessel, Captain John blew Discovery’s horn, which was followed by lots of horn and whistle blowing back from the passing boats and huge cheers from the crowds on both the north and south banks of the river. “Passengers returning to Discovery found the ship had been transformed with hundreds of jubilee flags and there followed an evening of celebrations including a traditional British Roast Dinner in the Seven Continents Restaurant prepared by Executive Chef Bill Anderson and his talented brigade of chefs as well as the “Best of British” show performed by Cruise Director Shawn Carter, the Discovery Orchestra and the Discovery Theatre Company. “As the last notes of the second house died away Captain John eased Discovery away from her Greenwich mooring and down river out into the North Sea bound for her next port of Dover.